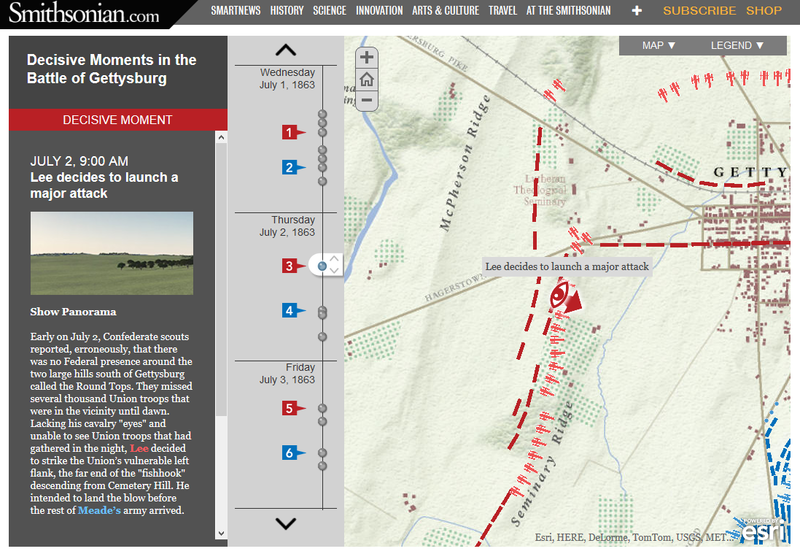 Decisive Moments at the Battle of Gettysburg is an interactive map hosted on Smithsonian.com. The map details events of the battle and the decisions made by commanding officers on both sides of the war. You can navigate the map by using the timeline on the left-hand side of the map or by clicking the placemarks on the map. While viewing the map you will see "eye" icons that you can click to view a panorama of that location. The panoramic view is of Gettysburg as it exists today. Decisive Moments at the Battle of Gettysburg could be a good resource to use to support middle school or high school lessons on Gettysburg. The map also provides a good model of using ArcGIS Story Maps to convey geo-located information. Your students could take the model of Decisive Moments at the Battle of Gettysburg and apply it to the creation of their own maps about significant moments in history.